Here is something you'll never see me wear. Literally. In fact, I'm so pale that if I wore something like this it would blend in with my skin color and turn me invisible. That's probably one of the reasons why I am not a big fan of "Safari Fashion". That and the fact that there are no zebras nor lions around where I live. So instead of head-to-toe neutrals, I like to break it up, and make it more interesting. 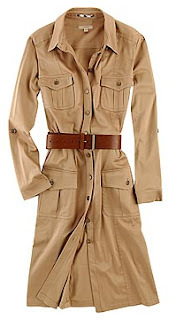 Take this Spring "must-buy" trench skirt, for example. It's neutral in color and safarish in look. You could choose to take it all the way and pair it with more neutrals (it's understood you have a tan or skin tone darker than milk). Or do what I do, and pair it with pink to make it much more feminine. 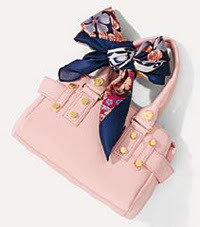 And don't forget a cute handbag. That's a good point - the safari look definitely requires good coloring to go with it. I like the idea of mixing something feminine with it! Sandra, it's from United Colors of Benetton. 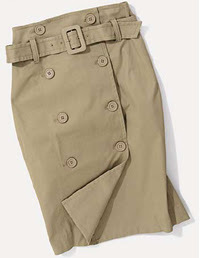 Banana Republic is the classic safari fashion brand... and personally, I don't like color with safari style. That's why they call is "safari style."